Everything that has been written about the Astronomical Clock in Rostock so far can be viewed and checked by the visitor. 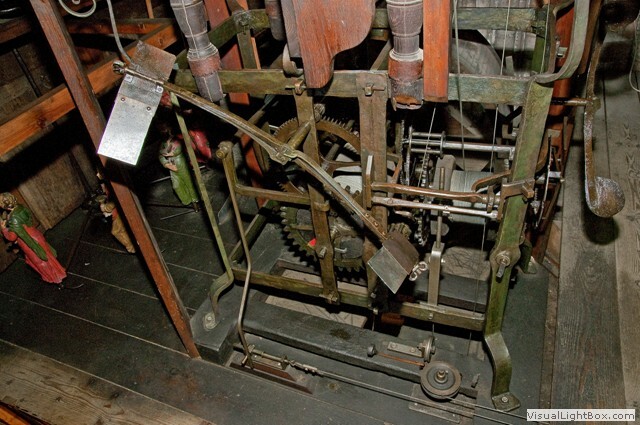 But unfortunately this does not apply to the clockworks, the “internal organs“ which set the Clock in motion. The narrowness inside the case as well as the narrowness of the room between the two columns in the choir and in the back wall of the altar does not allow a safe access to the clock works that are placed on three floors. That is why the function of the clockworks shall be described more precisely in the following. The complete works consist of 6 single works. 5 of them are activated by weights. The hand work (without an own drive) is moved by the main work (time work). The hand work is a movement of 5 cogwheels and 4 drives. The hands that incicate the position of the sun and the phases of the moon are moved according to in the rhythm of the month (27, 32 d) and the year (365 d). 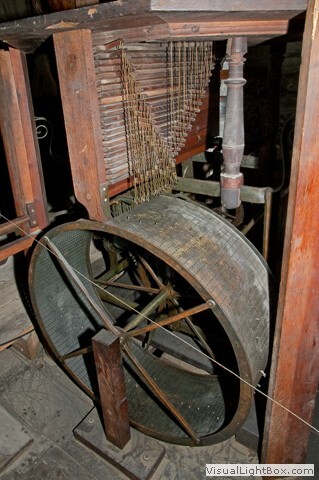 Only the hand that indicates the hours is directly connected with the day cogwheel of the main work. 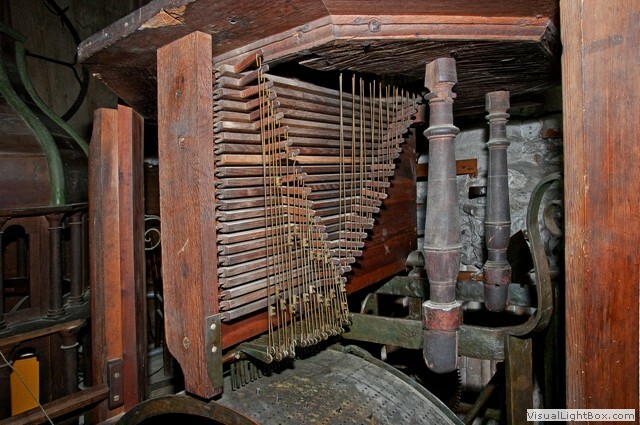 This day-cogwheel (1 U/d) consists of 288 teeth and contains a pin. 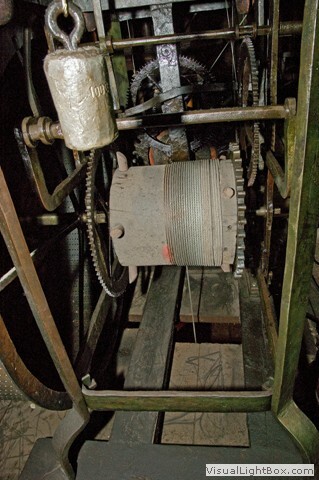 This pin is responsible for the release of the calendar work which is activated by a lever mechanism via cable at midnight. The disc of the calendar is moved by 1degree (accurately: 360°/365) then, because on the back of the calendar disc there is fastened a crown wheel which contains 365 teeth and which is moved one tooth further with every release of the calendar work. The calendar work was built in 1472 at the latest, but like the Apostle work it could maybe originate from 1379. So it belongs to the oldest of the available clockworks. 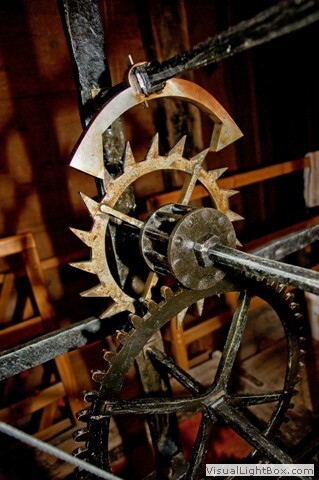 The hour-cogwheel (1 U/d) of the main work which contains 144 teeth possesses another pin. 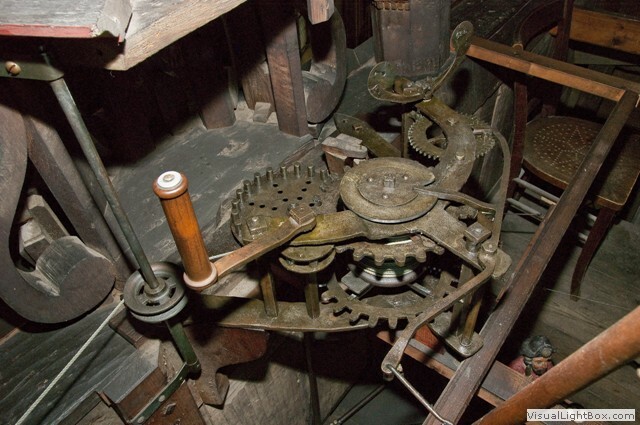 This pin is responsible for the hourly release of the hour-striking mechanism on the top of the three work levels which was built by the master craftsman Lorentz Borchardt in 1641/43. This mechanism also works via cable and angled lever mechanism. The hour-striking mechanism activates a small bell that strikes every hour. She sounds 156 times every day. 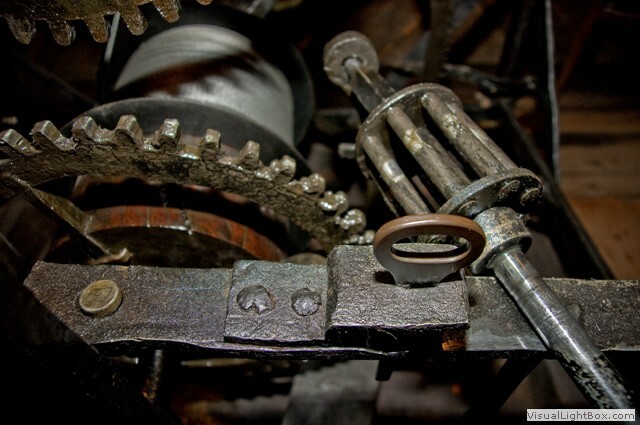 The music work is located inside an iron frame together with the hour-striking mechanism. This indicates a similar time of completion. Lorentz Borchardt not only created these two works, he also casted the two associating bells. On the invoice of the work from 1641/43 you can read the following note underneath the date of 19 October 1641: "Meister Lorentzen, Das Er die Glocken zur Sing Uhr selbst gegoßen, dafür ihm verehret, mit meiner Collegen consens 15 Gulden". 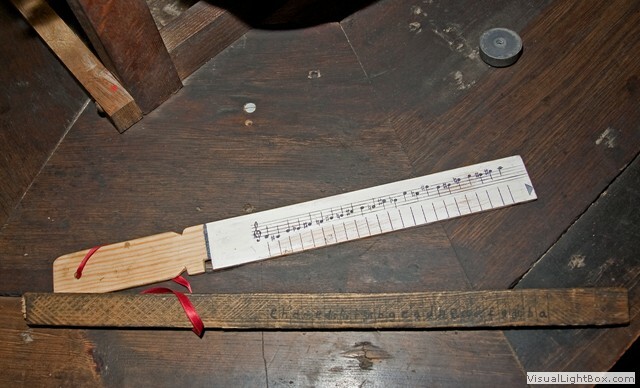 This note proves that Lorentz Borchardt was paid for casting the bells. The bells were restored in 1885. The music work is hourly released by the hour-striking mechanism after the strike. It moves for about one minute and turns a pin roller. This metal roller of about 78 cm diameter is 27 cm wide and looks like a modern washer drum. In 129 lines and 28 rows (23 of them are used at present) there are 3612 square holes. Inside these square holes one can place pins ("thumbs"). Above the 23 used rows of holes there are metal angles. When the drum moves the “thumbs“ knock against the angles. 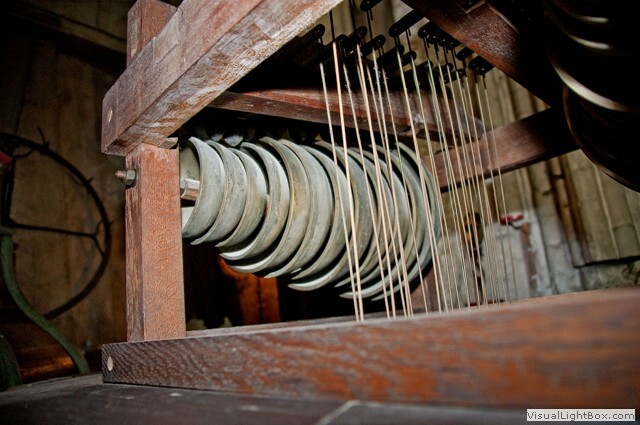 By means of a wire and angled levers bells with a diameter between 12.5 cm and 27 cm are struck and give a sound then. 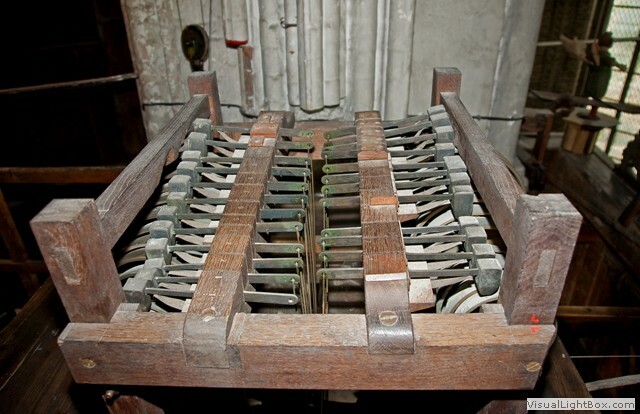 The place of the “thumbs“ in the rows of holes decides which of the bells sound indicating the tone pitch. The distance of the “thumbs” in the rows determines the distance of the tones. The progression of the “thumbs” in the rows produces the melody. From time to time it is changed by the organist according to the requirements of the Christian year. 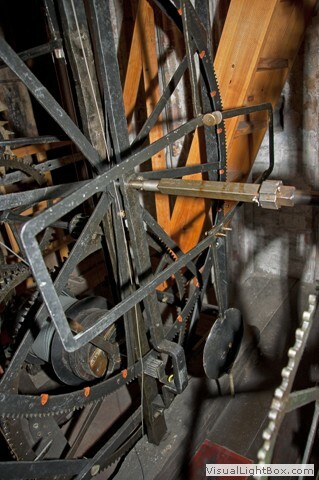 When the clockworks were restored in 1974/77 the Berlin metal restorer Wolfgang Gummelt installed a mechanism that could stop the glockenspiel and hour-striking mechanism between events and concerts. Last but not least the 6 work is the Apostle work. 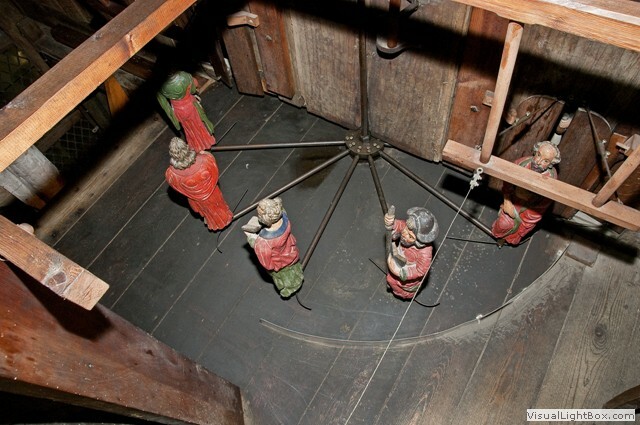 It is situated on the balustrade of the ornamental face of the Clock behind the wooden carillon. It is released by the hour-striking mechanism at 12.00 noon and at midnight. Then the doors left and right from the figure of Christ open and the annulus with the six Apostles moves. Metal holders underneath the figure‘s axes knock against pins. This way five of the six Apostles – Peter, James, John the Younger and John the Elder and Paul – turn to Christ when rotating. At the same time Christ blesses them with the exception of Judah. Like the calendar work the work of the Apostles originates from 1472 or even from 1379. The details that have been mentioned so far make clear that the main work can be considered as the "heart of the Clock" because every single movement inside and at the Clock are operated from there. 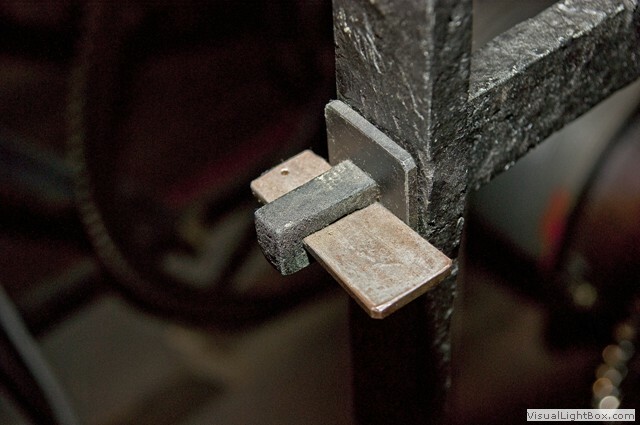 It is inserted in a hand-forged frame of 1.62 m hight, 1.22 m width and 0.79 m depth. Iron chocks connect the 29 larger parts of the frame. 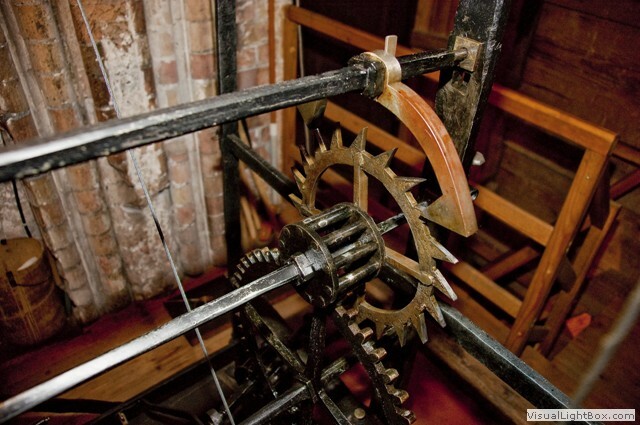 Since 1710 the main work has had a hook escapement. 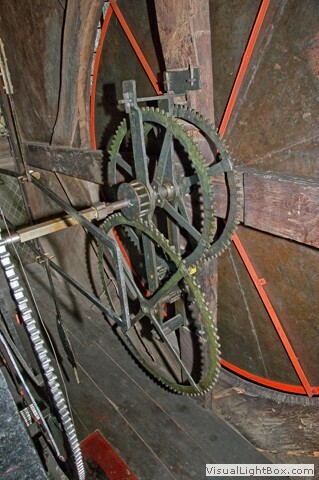 At this time the Rostock mergant and principal of the ST. MARIENKIRCHE, Hinrich Hoppe, replaced the original arbor escapement by a modern one. 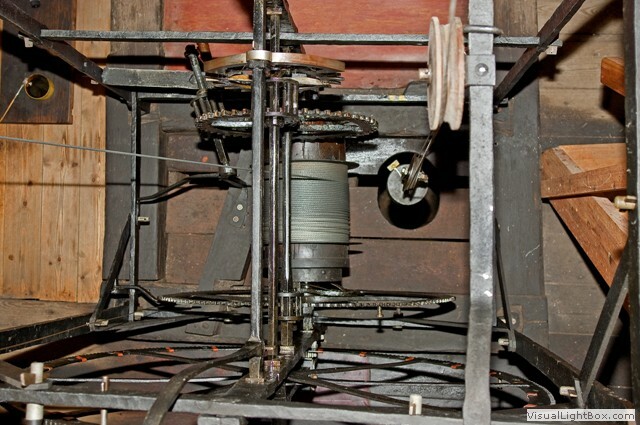 The pendular makes an oscillation (= a movement forward and back) in 3 seconds. 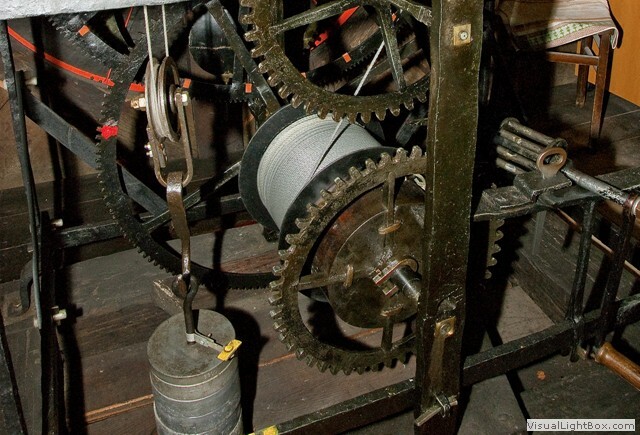 The anchor-cogwheel (20 teeth; see -> drawing of the clock work) turns once a minute. 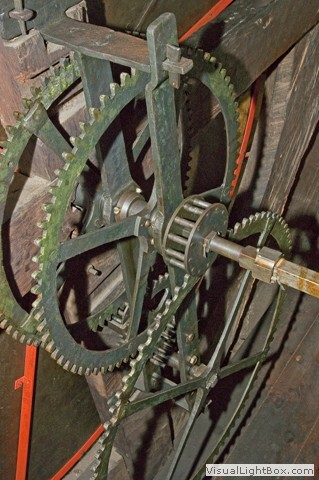 A valve drive with 10 pins on the arbor of the anchor- cogwheel engages another cogwheel with 50 teeth that turns around once in 5 minutes. This cogwheel moves the hour-cogwheel and then the day-cogwheel via valve drives with 12 pins each. 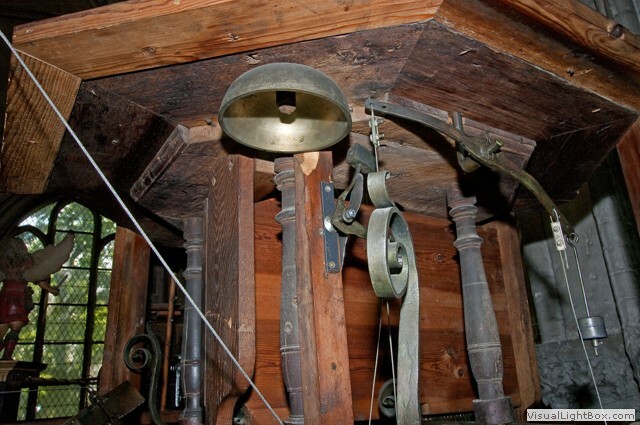 The day-cogwheel operates the arbor of the hour-hand which crosses the pendular (that is bended at this place for that reason). 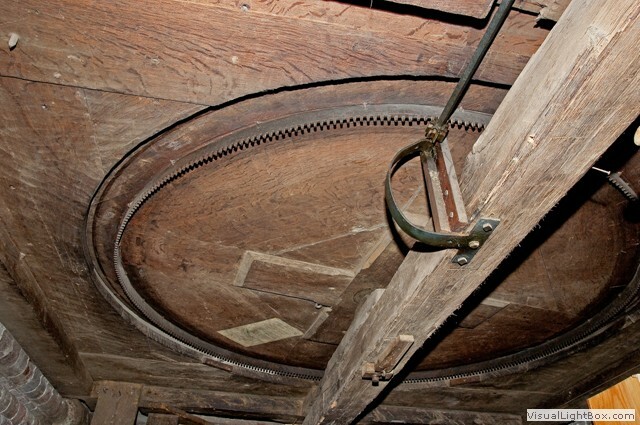 A roller-cogwheel consisting of 12 teeth is placed on this arbor. This is the place from which the hand-work is moved. The mode of operation you can see on the drawing of the clockwork: By means of roller drives and cogwheels at first the week-cogwheel and then the year-cogwheel and the (sidereal) month-cogwheel are operated. The year-cogwheel and the month- cogwheel are combined with the sun and moon disc by metal sections that are placed concentrically on the hand-cogwheel. 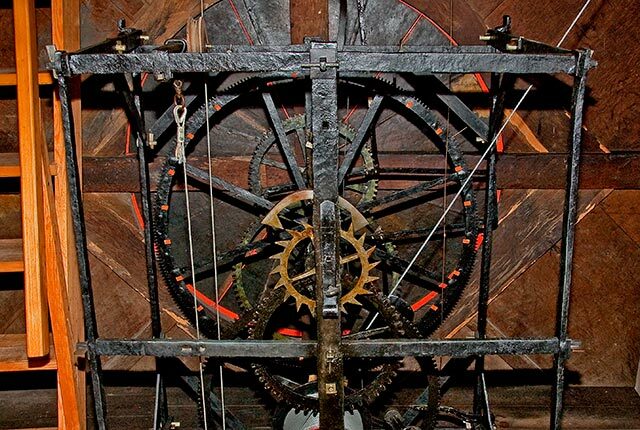 The clock work and the hand work originate from 1472 and were reconstructed in 1641/43. 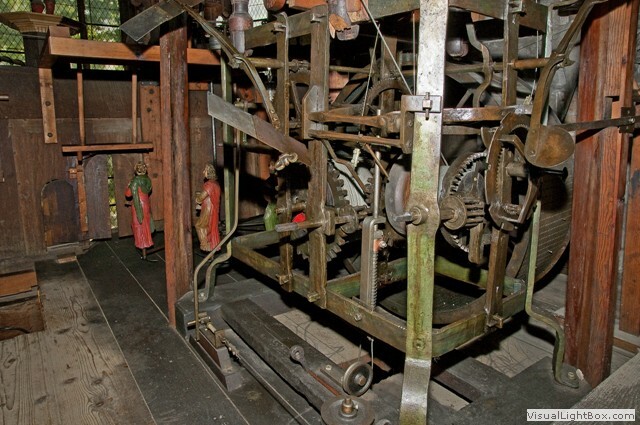 At that time Lorentz Borchardt removed an hour-striking mechanism which had long been unused. 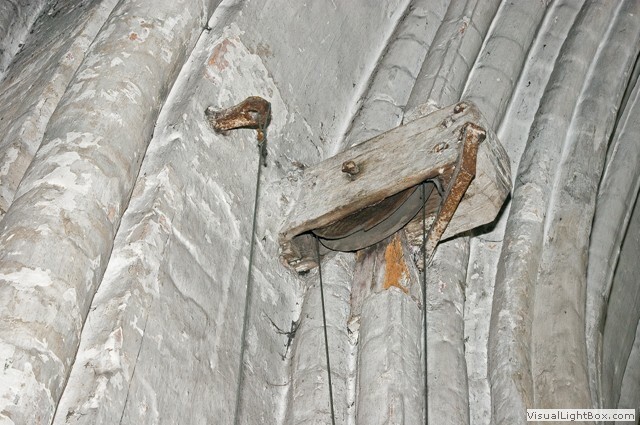 Originally this hour-striking mechanism released the wire connection to the bell in the tower. By then the ornamental clock in the church did not have its own bell striking the hour. 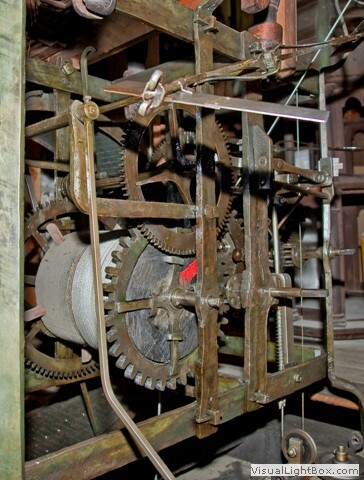 There was a similar connection between the clockwork and the bell in the MARIENKIRCHE in Lübeck until 1754. In both churches the long distance between the clockwork and the bell striking the hour might have been liable to break down. So the appointment to master craftsman Borchardt to give the Clock a separate hour-striking mechanism is more than comprehensible. 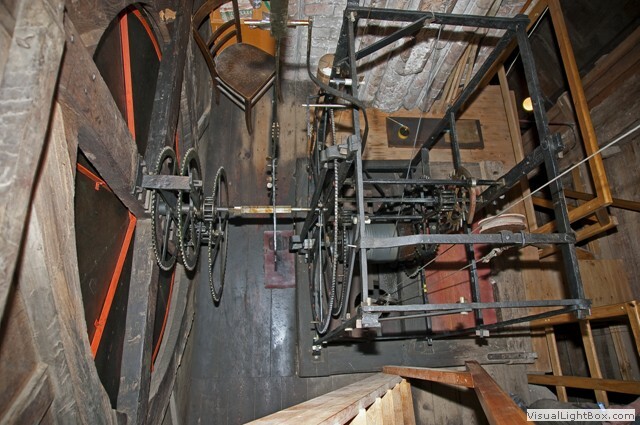 Today you can still see the place of the former hour-striking mechanism. 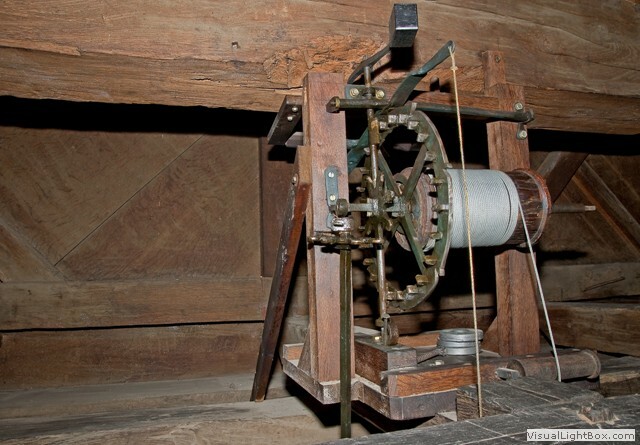 Then the main work and the hour-striking mechanism used to be located in the same frame on an oak beam. These wooden fundamental beams are preserved in original size. Around a half of them is still used today. Marks of chisels prove a diminishment of the iron frame. Parts of the frame show a lot of boreholes, notches and other marks of use. 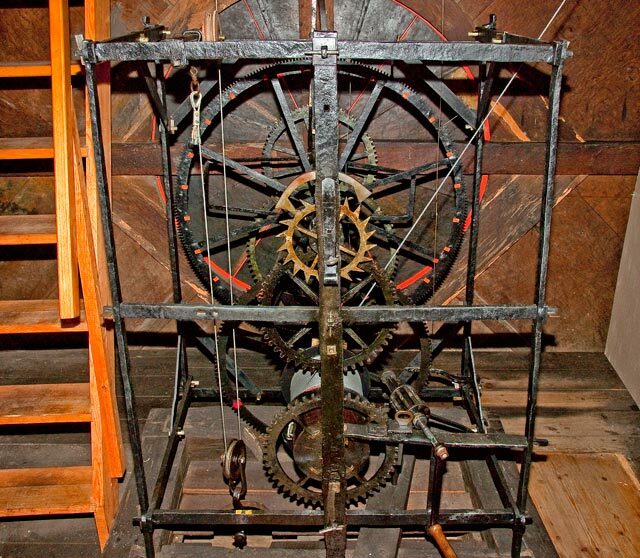 So Hans Düringer might possibly taken parts of the frame from 1379 for the new clockwork from 1472. This procedure was very common with hand-forged iron pieces at that time. The five clockworks are still wound up by hand, four of them every day. The calendar work is wound up once a month only.